Stainless steel case with a black rubber strap. 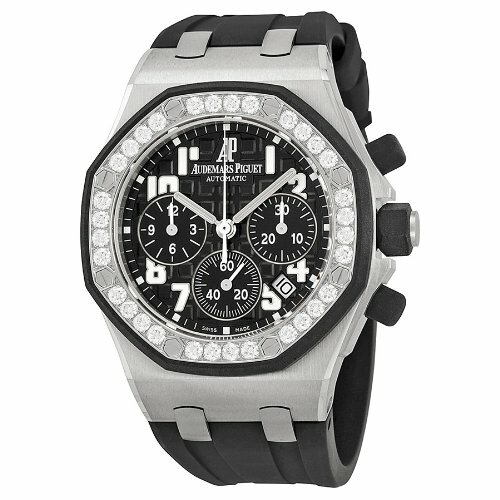 Stainless steel bezel set with 32 diamonds. Black (waffle tapestry) dial with luminous hands and Arabic numeral hour markers. Minute markers around the outer rim. Dial Type: Analog. Luminescent hands and markers. Date display appears between the 4 and 5 o'clock positions. Chronograph - three sub-dials displaying: 60 second, 30 minute and 12 hour. Automatic movement with 40 hour power reserve. Scratch resistant sapphire crystal. Rubber clad stainless steel crown. Solid case back. Case diameter: 37.0 mm. Case thickness: 12.0 mm. Round case shape. Band width: 10.05 mm. Band length: 7.5 inches. Deployment clasp. Water resistant at 50 meters/ 165 feet. Functions: hours, minutes, seconds, calendar, chronograph. Sport watch style. Watch label: Swiss Made. 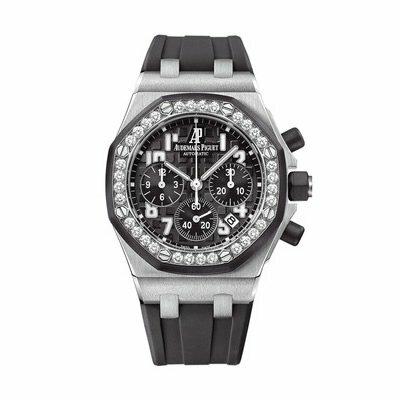 Audemars Piguet Royal Oak Offshore Black Dial Ladies Watch 26048SKZZD002CA01.